ST. GEORGE, Utah -- (Press Release) The Bureau of Land Management (BLM) is accepting the publics input on a proposal to amend the Arizona Strip Resource Management Plan (RMP) as part of its evaluation of the proposed Lake Powell Pipeline route in the Kanab Creek Area of Critical Environmental Concern (ACEC), located south of the Kaibab Paiute Reservation. Approximately 1.5 miles of the proposed pipeline would run through the Kanab Creek ACEC, with a small portion (900 of 13,148 acres) affected. Of this, approximately 1.0 miles would be located within a designated utility corridor. The BLM must complete the RMP amendment in order to address planning inconsistencies between the proposed water pipeline route and the existing designated utility corridor. said Arizona Strip Field Manager Lorraine Christian. The BLM works with the public to determine responsible uses of working landscapes, such as this proposed water pipeline project, which has the potential to benefit local communities through improved infrastructure, job creation, and economic growth. The BLM has scheduled public scoping meetings in communities near the Kanab Creek ACEC. During these meetings, the public can provide input to the BLM on relevant issues that will influence the scope of the environmental analysis, including alternatives, and help guide the planning process. In addition to the public scoping meetings, the BLM plans to host an Economic Strategies Workshop to provide an opportunity for regional businesses, governments, and community organizations to discuss regional economic and social conditions and trends related to the RMPA only. Comments may also be submitted via mail and email. The comment period ends August 3, 2018, which is 15 days after the last public meeting as stated in the NOI. in the subject line of your letter, fax or email. All comments will be made available to the public. 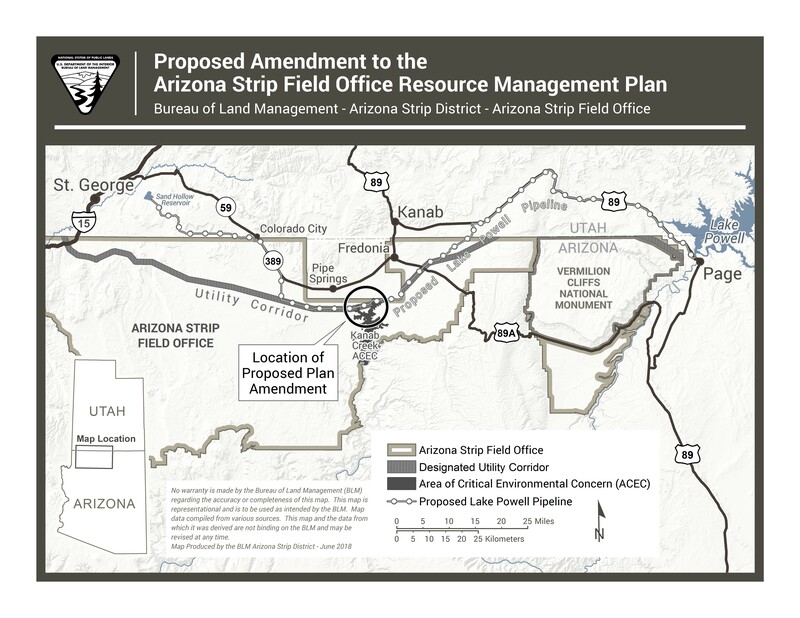 The Notice of Intent, which was published today in the Federal Register, announces BLMs intent to analyze the proposed amendment to the Arizona Strip RMP related to the Kanab Creek ACEC. The BLM will incorporate the analysis for the RMP amendment into FERCs Environmental Impact Statement for the larger Lake Powell Pipeline Project. FERC will analyze the proposed pipeline project and the proposed RMP amendment to consider allowing development of the Lake Powell Pipeline within the Kanab Creek ACEC.